A 2008 article published in the "Rheumatic Disease Clinics of North America" journal, recommends weight management exercises, such as bike riding and physical therapy as the first line of treatment for hip osteoarthritis. Biking, especially on a stationary bike is safe, low-impact and increases your thigh or quadriceps strength. Consult your physician before biking. Hip osteoarthritis is the deterioration of the cartilage and bone within your hip joint. Symptoms include pain, joint stiffness and grinding of your hip joint with movement. Weight-bearing activities such as running can aggravate your symptoms. As hip osteoarthritis progresses, you may also experience joint instability, muscle weakness and constant pain or aching. Since osteoarthritis is not curable, exercising such as bike riding is one way to help manage symptoms associated with hip osteoarthritis. Riding a stationary bike is safer and may be more comfortable due to the controlled environment when compared to biking outdoors. Riding a bike outdoors brings in such variables as terrain, weather and wind. Rough or hilly terrain like with mountain biking can lead to hip discomfort -- and as with any outdoor biking, you run the risk of falling off the bike. If you decide to bike outdoors, bike on flat terrain to avoid hip discomfort. Riding an upright or recumbent stationary bike provides a low-impact cardiovascular workout and helps to strengthen your quadriceps muscles. Stationary bikes also allow you to control and monitor your resistance level and pace. 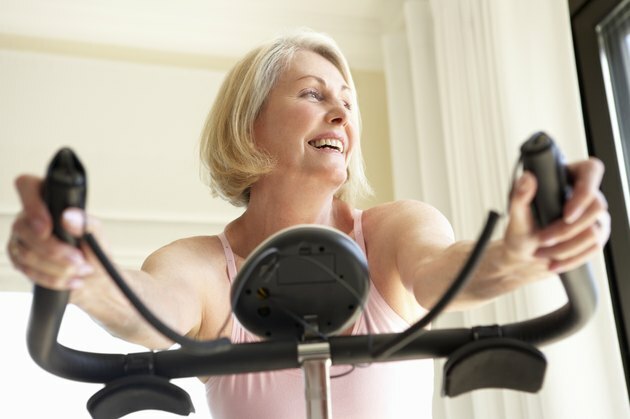 The difference between upright and recumbent bikes is the position of your hips. In an upright bike, you are straddling the seat allowing more hip extension, where as in a recumbent bike you are seated, which reduces hip extension. Therefore, some hip osteoarthritis sufferers may find the position of a recumbent bike more comfortable than an upright bike. Your bike seat may be adjusted to help place your hips in a more comfortable position as well. Most seats on upright bikes can be adjusted up, down, forward and back. To start, adjust your seat height so your knees are slightly bent with the pedal in the down position, and adjust from that point. With recumbent bikes, the seat moves forward and back. Like the upright bike, adjust the seat so your knees are slightly bent. Finding the best seat position for you may take several adjustments. The appropriate frequency and duration of bike riding varies. However, start biking a few days a week for 10 to 15 minutes and progress from there. Start with a low resistance on a stationary bike or a lower gear on an outdoor bike until your muscles and joints adapt. Due to the lack of research on biking guidelines and contraindications for osteoarthritis sufferers, monitor your symptoms while bike riding and follow your physician's guidelines to avoid injury and pain. Although bike riding is usually comfortable for osteoarthritis sufferers, you can still experience hip pain. If you have pain, stop biking and consult your physician immediately.